The study of childrenâs literature and culture has been experiencing a renaissance, with vital new work proliferating across many areas of interest. 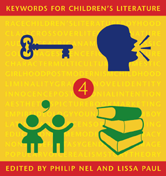 Mapping this vibrant scholarship, Keywords for Childrenâs Literature presents original essays on the essential terms and concepts of the field. From Aesthetics to Young Adult, an impressive, multidisciplinary cast of scholars explores the vocabulary central to the study of children's literature.